Well, it is just about that time again. No, not the time to sacrifice virgins to uncouth gods. That isn’t for a couple more months. It is almost time to go back to school and if your teen is tired of being swamped in the miasma of cutesy or plain school supplies, you should check out Rock Paper Pencils. 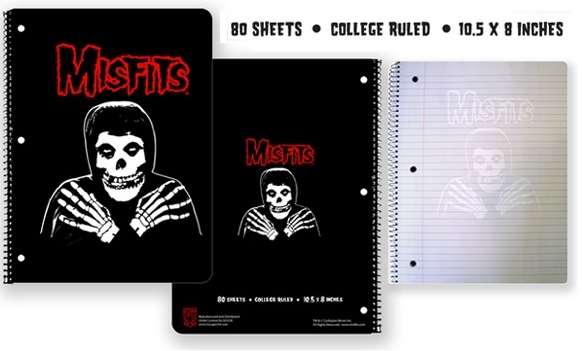 The items that I had the opportunity to check out were some of their spiral bound notebooks, pens, and, of course, pencils from Danzig, The Misfits, Social Distortion and My Chemical Romance. The notebooks are my favorite as each page is printed with a light version of the image on the cover. My personal favorite in this is the Misfits version. The is just something cool about jotting down notes and seeing the ever-awesome Crimson Ghost skull in the background at all times. The pencils are your standard #2 writing pencils except instead of your stock yellow paintjob that is all too reminiscent of the yuppy Hummer, they get a much cooler custom hotrod finish in Soulless Black with the band’s logo and artwork all around. The Social Distortion pencils are the ultimate in smooth. I can’t let them be anywhere but at work where they are in constant use. The pens are a capped pen with the same kind of artwork that is on the pencils. My only regret was that the pens could have been a smoother write, but I am also spoiled by high-end writing instruments. These pens are more than adequate for jotting down your teacher’s notes or passing notes in class. For your average school kid trying to make an impression or stand out from the crowd, Rock Paper Pencils definitely rocks. Save the virgin sacrifice for after you graduate.